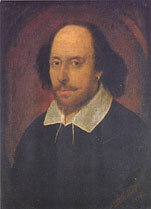 Shakespeare's reputation as dramatist, poet and actor is unique. He is considered by many to be the greatest playwright ever, and his plays have merited translation and performances in cultures far removed from medieval England. Sadly his life-story remains ill-documented, and what we know of him is ironically prosaic. But the prophecy of his great contemporary, the poet and dramatist Ben Jonson, that Shakespeare '... was not of an age, but for all time', has been fulfilled. He was born in Stratford-upon-Avon in Warwickshire, England, and was probably educated in the town's free grammar school. His learning was dismissed, again by Ben Jonson, as 'small Latin and less Greek'. His early acting career probably began with performances before a network of recusant gentry living around Warwickshire, where he served as a resident player under the pseudonym Shakeshaft. Then in 1582 he married Anne Hathaway, but he is believed to have left her behind to pursue his career in London. By 1588 he is thought to have started writing plays. From 1594 Shakespeare worked as an actor with the Lord Chamberlain's Company - renamed the King's Company in 1603, when James I of England succeeded to the throne. Among the actors in the group was the famous Richard Burbage. The group acquired interests in two theatres in the Southwark area of London, near the banks of the Thames - the Globe and Blackfriars. The first collected edition of Shakespeare's works, known as the First Folio, was published posthumously in 1623. The plays fall into the categories of history, tragedy, comedy and tragicomedy. Shakespeare openly drew on contemporary historical sources so that his work - especially the history plays - represent a type of celebratory Tudor propaganda. The plays offer complex portrayals of a world in transformation, for example with the discovery of the New World, which is represented in the final play The Tempest. Much of his poetry is dedicated to his patron Henry Wriothesley, 4th Earl of Southampton, and it has been argued that Wriothesley is the male subject of Shakespeare's love sonnets. Shakespeare invented 1700 words. Bandit, blanked, eyeball, elbow, laughable, lonely, madcap, moonbeam - all these simple words we take for granted were actually Shakespeare's inventions. Puritans viewed his plays as sinful and claimed that theatre stimulated 'whorish lust'. The ANC drew inspiration from Shakespeare during the struggle against apartheid. Anyone who's anyone has played Hamlet: Laurence Olivier; John Gielgud; Anthony Hopkins; Mel Gibson, even Sarah Bernhardt.